Open Revolution: Do you vote for Crazy? Do you vote for Crazy? Imagine an electoral scenario where two parties, we'll call them 'Crazy' and 'Crazier' are the front runners - both at 45% in the polls. In this hypothetical scenario, Crazy will raise taxes 50%, and Crazier will raise taxes 100%. You prefer 'Safe' who doesn't want to raise taxes at all, but they're polling at 10% and don't have any chance of winning. Question: Do you throw your vote away on Safe to make a statement or vote for Crazy, hoping to keep Crazier out of office? Voting for Crazy means lying on your ballot, because you'd rather have 'Safe' win the election. In an election between Crazy and Crazier, you come out better (with lower taxes in this simple scenario) by electing Crazy than by voting for Safe. The election system is lousy. It's hard to change, because whoever's in charge was elected thanks in part to the biased system they benefitted from. Fixing the system would mean giving up power. A system which allowed you to rank your preferences would let you vote honestly, declare your true preferences for Safe, while still making clear that you'd prefer Crazy over Crazier. Or do you even bother voting? There are two reasons to vote, and two reasons not to, according to Riker and Ordeshook's "Calculus of Voting" (1968). It's your duty (D) to vote, and your vote might determine the election (π) and therefore benefit you (B). Voting costs (C): it takes time and effort to decide who to vote for, and time and effort to go to the polls. If πB+D>C, then you vote. 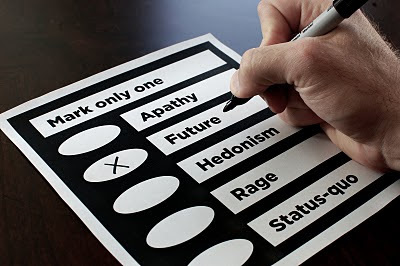 The probability of casting a decisive vote is vanishingly small, so mostly it comes down to how each citizen values voting against the effort of doing so, and against better uses of their time. Corollary: If everyone else realizes their votes won't matter and stays home, then when you vote, you'll decide the election all by yourself. Of course you aren't likely to cast the only vote either. What actually happens is somewhere in between, approaching the Nash equilibrium (A Beautiful Mind) for whether it's worth voting or not. Find leaders who can see beyond election cycles.